Eating seasonally is a pleasure for most of the year, and fall is a wonderful time to eat carrots. We all know how healthy carrots are, so I’ll skip over that part and concentrate on how delicious they are. When I cook carrots I make a lot, because they are wonderful for at-your-desk lunching the next day. Usually I retrieve my lunch from the refrigerator at my mid-morning brief break and eat it at room temperature at lunchtime, as long as no egg yolks, mayonnaise, or other extreme perishables are involved. If I plan to eat them at room temperature for lunch I use olive oil instead of butter, since animal fats congeal unattractively when they aren’t hot, but if you prefer to use butter, no problem. Just heat your carrots a little the next day, then carry them back to your desk and eat happily, with the slightly smug glow that comes of doing the right and healthy thing and getting your work done at the same time. First, catch your carrots. Real carrots come in bunches with the tops on, and if the tops look withered, don’t bother with those carrots. Get some fresh ones instead. Your nearest growers’ market is a great place to shop for them. Here in Albuquerque you can find several colors, including yellow, the standard orange, red, and a glowing royal-purple. I love the purple ones, but any of these techniques can be used for any carrot. Blanch, then saute’: trim and scrub four large carrots or six smaller ones of any color. Peel if needed (usually I scrub well with a brush instead.) Slice into slices about a quarter inch thick. Fill a large saucepan with about 2 quarts of water, add 2 teaspoons of salt, bring to a boil, toss in the carrots, boil 5 minutes, and drain thoroughly. If you want to, you can hold the drained carrots at room temperature for 2-3 ours, making it easy to do some work ahead of time if needed. Melt two tablespoons of butter in a frying pan, or use olive oil if you prefer. Put in the carrots, 2-3 teaspoons of honey, salt to taste, and a grating of fresh nutmeg. Saute’ over medium heat until the carrots are done to your liking, and serve. The blanching makes sure that the carrots cook evenly, and the saute’ing brings out their flavor. 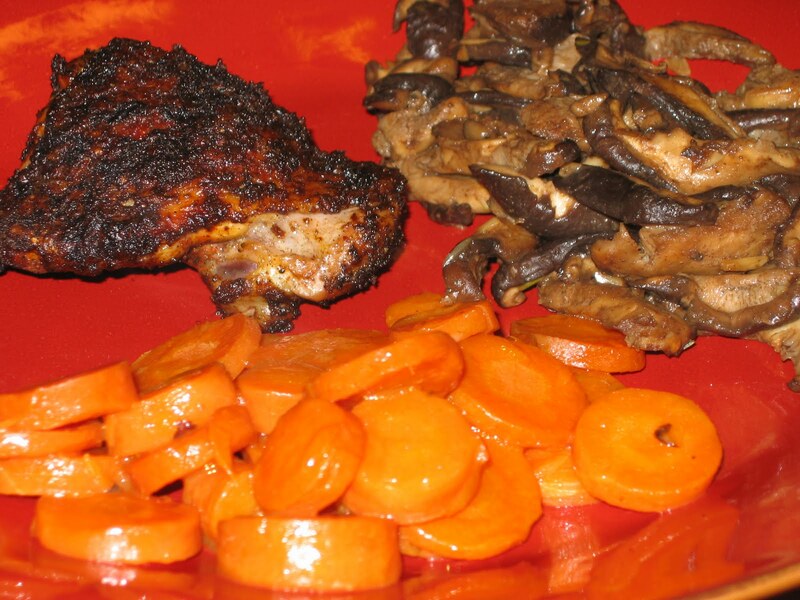 You can vary this infinitely: add herbs in the saute’ stage; thyme or savory are especially good with carrots. Chop a clove of garlic or half a small onion and cook in the butter or oil until just cooked through before adding the carrots. Use a tablespoon of balsamic vinegar instead of honey. Add a squeeze of fresh lemon juice for a very fresh flavor. Add half a teaspoon of grated orange rind with the honey. Add a tablespoon or two of dark rum and cook it off thoroughly before serving. Or, if you have access to some good artisanal root beer (I brew my own. Just don’t use the grocery-store glop) you can add a quarter cup of it when you add the carrots to the butter, and cook over high heat until the root beer is reduced to a syrup that just coats the carrots. A quarter-cup of dark ale produces a malty, ever-so-faintly bitter glaze that’s great with game. You can also cut the carrots into chunks about 2 inches long and then cut those into quarters at the initial prep, for a different texture. When using orange carrots, sometimes I cook a couple of purple potates separaely, slice them, and add them in for the saute’ stage. Grilling: Usually people don’t think of grilling carrots, which is a shame, because the caramelization around the edges is delicious. Just cut them thinly. I like slices about 1/8” thick. 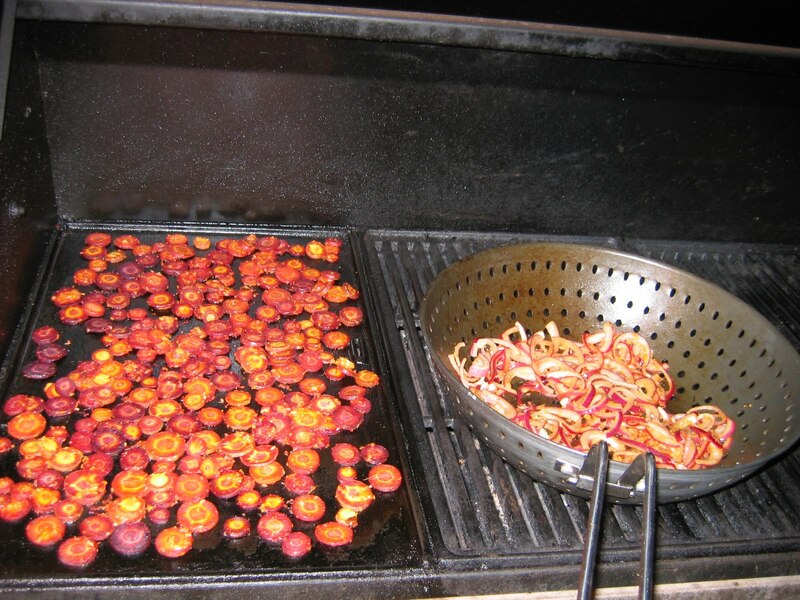 Use a griddle or grill-wok so they don’t fall through the grill, and watch them closely so that they don’t burn. I describe a Southeast Asian seasoning here, but again the technique is key, and once you get the hang of it, you can season them any way you like. Trim and scrub 3-4 large carrots of any color, and slice them thinly. Toss with two chopped cloves of garlic, a 1” chunk of ginger grated, a tablespoon of Asian fish sauce (you can use soy sauce instead if you insist,) a tablespoon of agave nectar or coconut sugar, and 2 tablespoons of canola oil or similar. 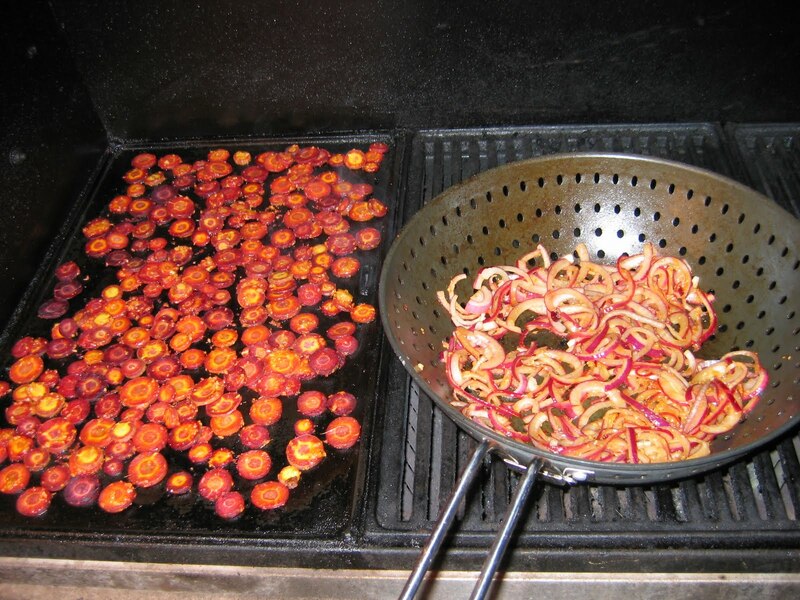 Heat the grill to medium-high and spread the carrot slices out on the griddle section or put them in the grill-wok. If griddling them, turn them in bunches with a spatula about halfway through. If using the wok, you will need to turn several times during cooking. Taste to see when the texture seems just right to you, salt a little if they need it (the fish sauce is fairly salty) and serve with some chopped cilantro on top. This time of year, parsnips are your friends. They are sitting patiently out in the garden waiting for you to get to them, never demanding any special attention or winter storage. During hot weather they weren’t worth eating and you tended to forget about them, but while you were catering to the flighty tomatoes and peppers, they were biding their time. When the needier vegetables gave in to the frosts, they started to convert their stored starches to sugars. Now, whenever you can pry them out of the cold ground, they’re ready to meet you halfway with a sweet flavor that repays your labor. I love them roasted, but for whatever reason I’m not big on white vegetables, and I started looking for something to relieve their snowy monotony. 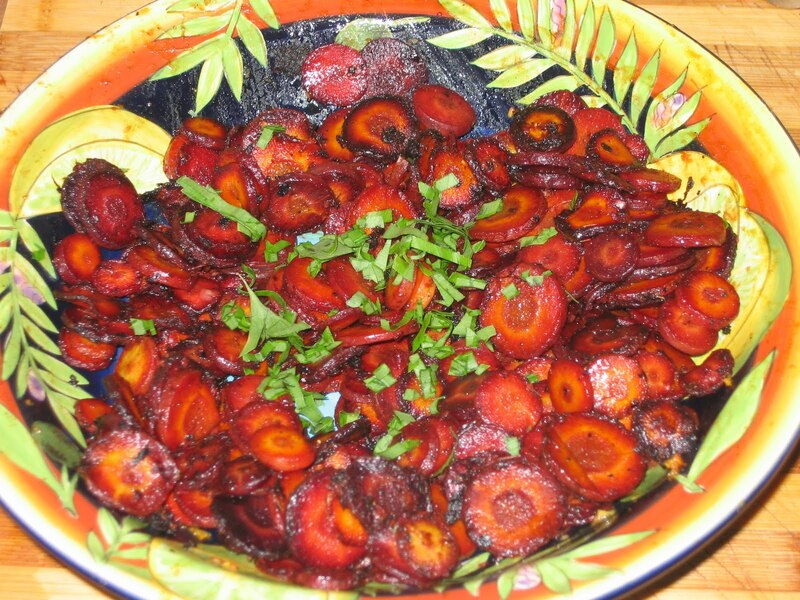 Finally I settled on their visual opposite, the deep purple carrots that become almost black when roasted, to create a dish with a little drama. Clean two big parsnips and cut them into chunks no more than an inch on any side. 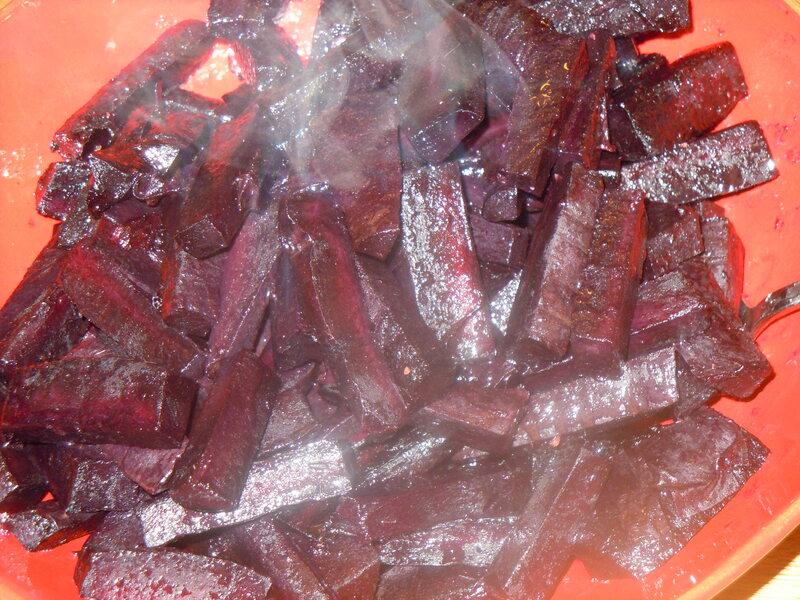 Thoroughly scrub 3 large purple carrots and cut them into chunks somewhat smaller than the parsnips. Combine a quarter cup of good olive oil, a few tablespoons of white wine, half a teaspoon of salt or to taste, and two cloves of chopped garlic. Now this part is important: Put the carrots and the parsnips in two separate bowls and toss each with half the olive oil mixture. Don’t toss them together, because the carrots will “bleed” and stain the parsnips an unattractive magenta in places. If you are using regular orange carrots, separation doesn’t matter. 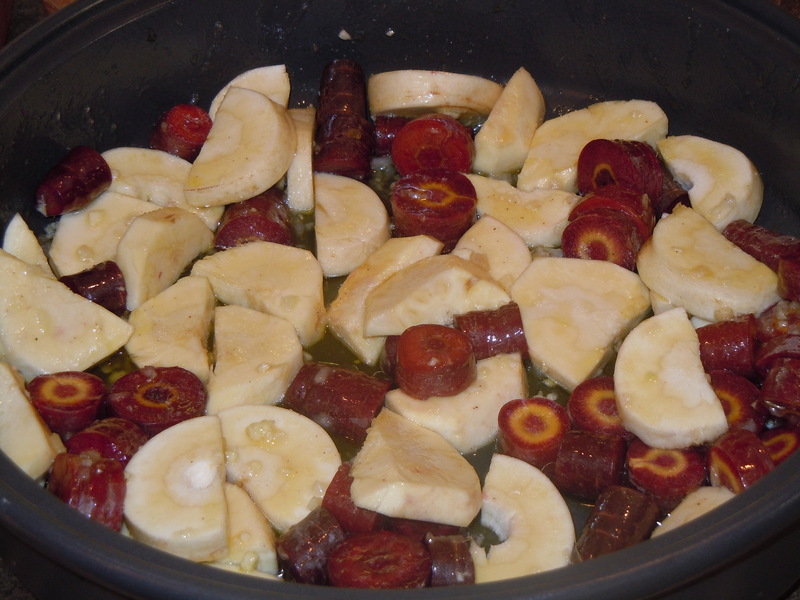 Put the pieces in a cazuela big enough to hold them in one layer, or use a 9X13 heavy pan lined with parchment paper. Roast at 325. 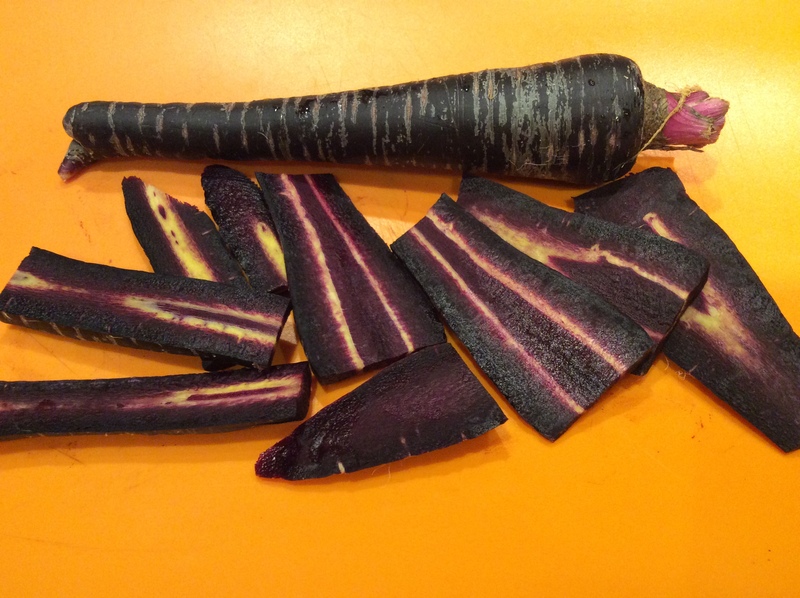 Don’t toss them around during roasting, because of the staining problem from the anthocyanins in purple carrots. The timing will vary a lot depending on the tender/tough ratio of the roots and on your personal taste. I like winter root vegetables roasted until they are soft and well caramelized, and it usually takes close to 2 hours at this low heat. 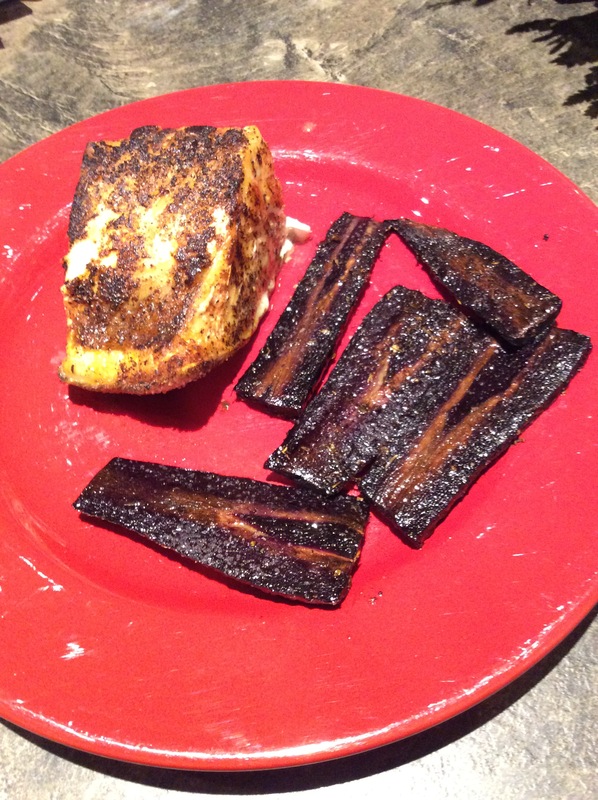 If you like yours with some crunch you can stop cooking them sooner, but taste them before turning the oven off. These are not the tender roots of summer, they’re big meaty winter roots, and you may not like the amount of crunch they retain. If necessary, cook longer. Sprinkle a little bit of minced parsley over the top. If you want to be sure they’re done in time for dinner, cook them a little earlier in the day and leave them slightly underdone, then return to the oven for a final 20 minutes before dinner. A big serving of these “white and black” roots on a red plate makes a great main course with a little piece of something meaty in the center. A few thighs of good pastured chicken seasoned with thyme, garlic, and olive oil can be roasted in the same oven for the last hour or so of cooking and will accent the roots nicely without overwhelming their flavors.